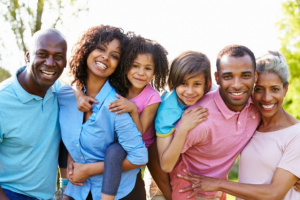 Being There for families, friends, and community is an African American tradition. Being There and being your best means that you take charge of your health and take care of your life. Being there also means you become knowledgeable about diseases like breast cancer. The fact is breast cancer is on the rise among black women of all ages. Chances are you know someone who has had or now has breast cancer. Unfortunately, aggressive disease and late diagnosis can decrease survival. Breast changes are common in all women and our breasts normally feel fatty, lumpy and ache during our menstrual cycle or pregnancy. Learning how to detect breast cancer should be a part of every woman’s life. It is important for you to do your monthly breast self-examination, get a clinical breast examination and physical, get a mammogram as needed and see your healthcare provider immediately if your find lumps or suspicious changes in your breasts, armpits and chest. Men can also get breast cancer. Please do not let feelings of embarrassment, lack of insurance, myths, shyness or fear of cancer keep you from the medical attention that could prolong your life. You deserve to be healthy, happy and strong. By taking positive action for screening and diagnosis many black women are alive and well today because of early detection and early treatment. Be there for yourself so you can Share, Support and Survive.